Infatuation I was able to present a finished quilt to honor my coworker at her retirement party. I probably shouldn't say so, but I love how it turned out. 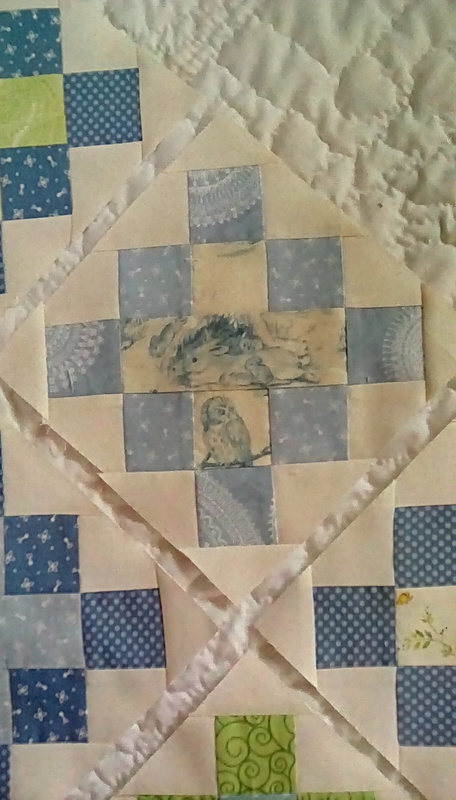 The idea for the quilt design began because she and her family are patriots. 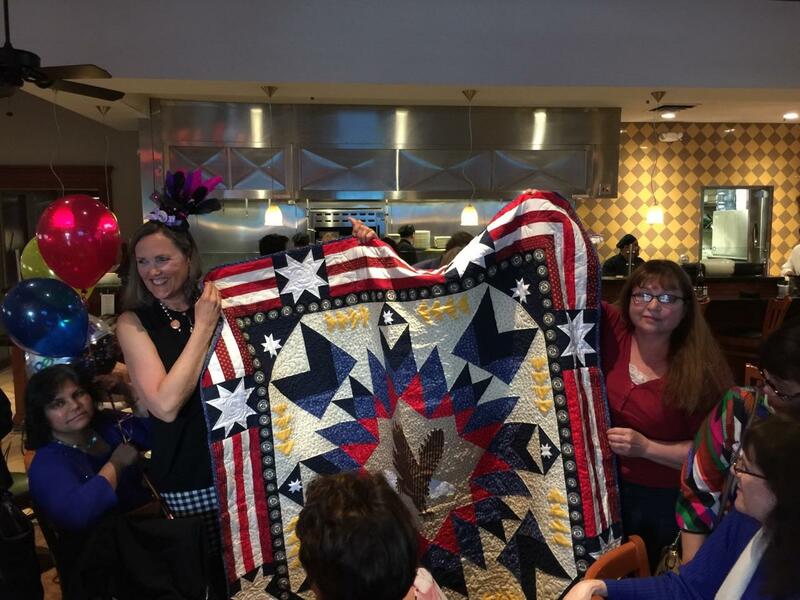 Her husband served in the Navy and her son is currently serving in the Navy in some kind of special operations. 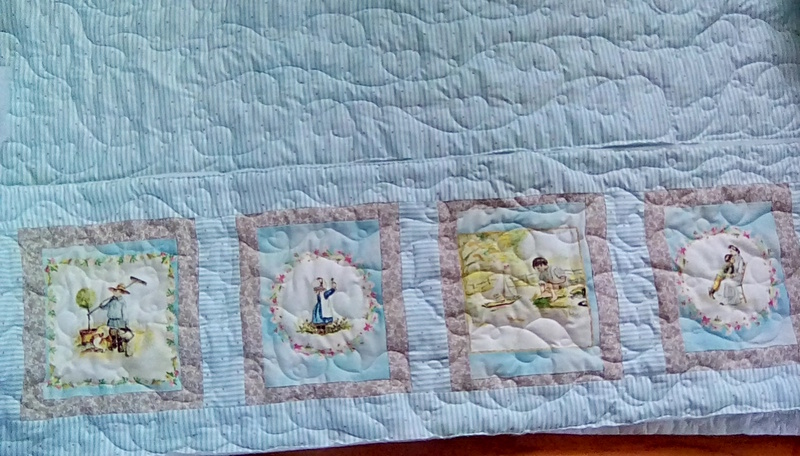 This is the crib bumper I was working on, but stopped since crib bumpers aren't recommended. 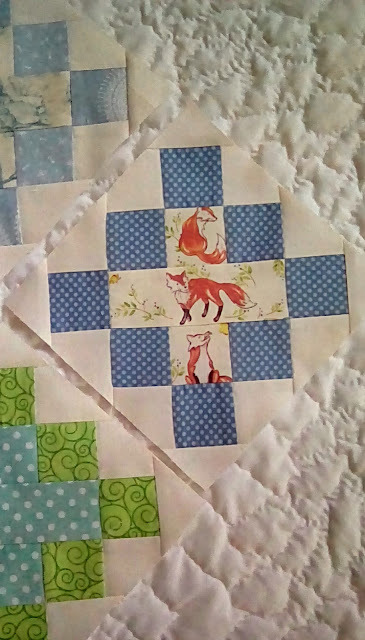 Now I'm trying to decide whether to make it into something else like a quilt. I think I could cut it apart and sew pieces of the vertical striped fabric to connect the pieces and then requilt those areas, but I don't feel very enthusiastic for now anyway. 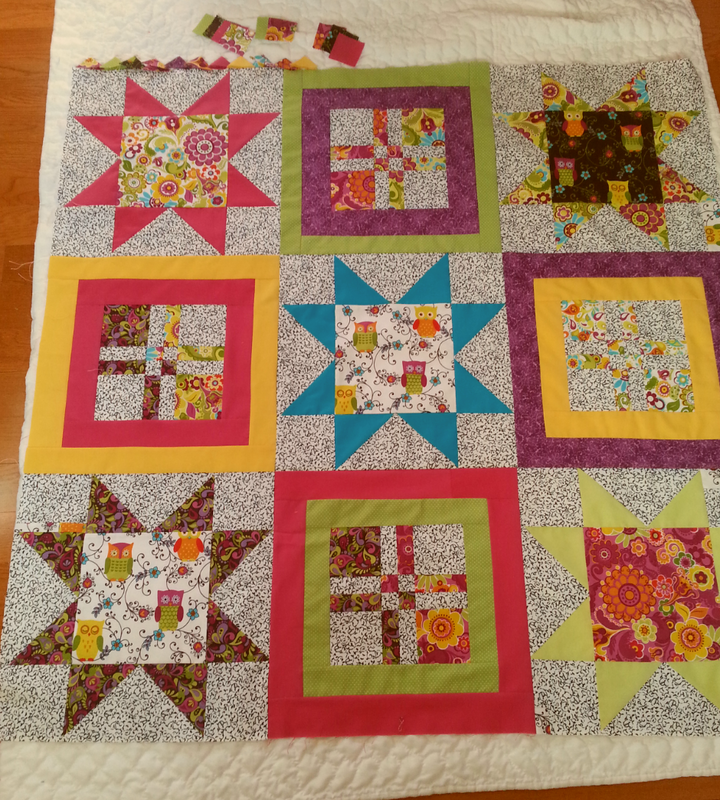 So I started making granny squares with some 2" squares. 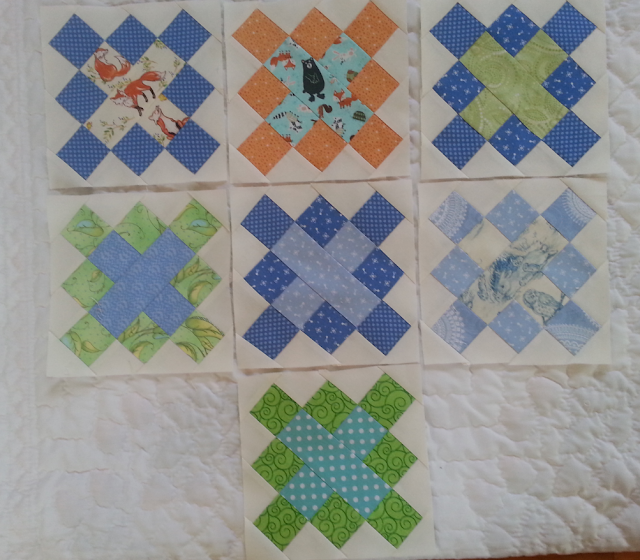 Squares finish at 7" unfinished. This unfinished quilt is for Thea, a little baby born to a coworker a few days after Teddy was born. I think I can get it loaded on the quilting machine soon. 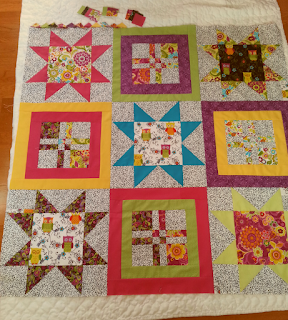 It will be cute with the prairie point border, especially if I can get a better camera! Looks much better in person than in these photos. P.S. I have a little hole in my heart for my dear Riley, only 2 1/2 years old, lost last Friday to mouth cancer. I hope to greet her in heaven some day and hug her tightly. Sheri, first off, I know your pain. 2 1/2 years is so short and not fair. Riley looks like the sweetest girl ever, and she has "frootbat ears" just like my kitty boy Pierro. He was my sweet cornish rex kitty boy, and he died last November. I am STILL missing him. I still cry. I am learning though. I tell myself "I am not alone. Others are suffering from heart ache or worse" You should not do that yet. 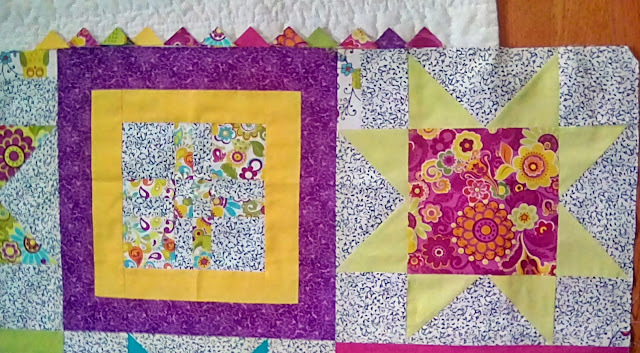 Sheri, your projects are wonderful. I wanted to make crib bumpers too, and got nixed! :-D You could make this thing, ... my daughter bought it, but you could look online. basically it is a cover for the top of the rail. They sell some pads to secure on so when they are chewing on their crib, they do not eat their crib rail haha. My kids never did that. So sad to read about the loss of your dog - you will certainly miss her love and pretty face. Cute little grand baby - just think of all the sewing projects you will get to do! So many things going on in your life. 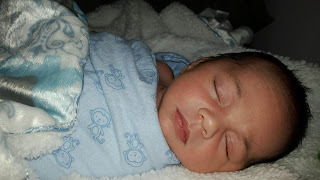 Congratulations on the new little guy.... so cute and sweet. 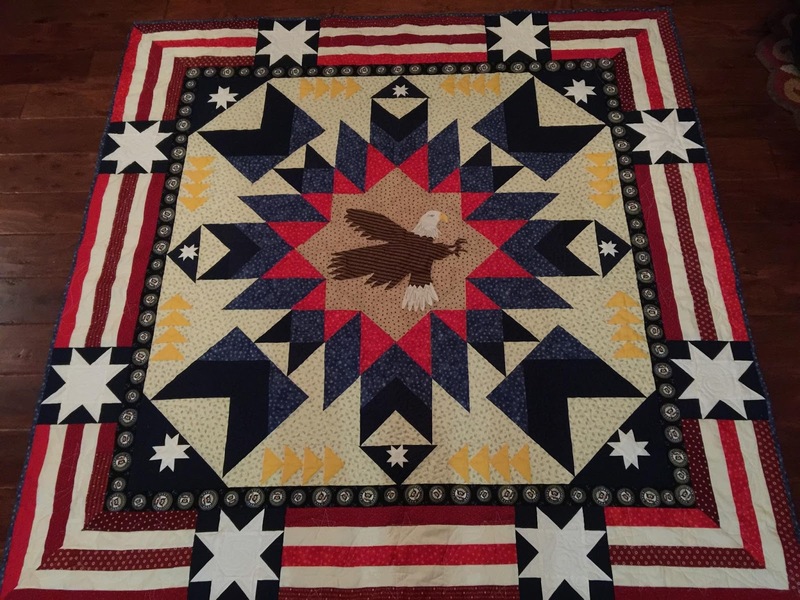 The eagle quilt is beautiful! I can imagine that it will be thoroughly enjoyed. And so so sorry for the loss of your sweet pup. They wag their tails into our hearts don't they. I can just imagine our sweet golden retriever meeting us on the path again someday.